Is your social media audience losing interest? Do you want to tap into your followers’ emotions? Using psychology to connect with your target audience is a powerful way to engage and motivate them to take action. In this article you’ll discover five psychology principles you can use to improve your social media marketing results. Discover how to improve your social media results with psychology. In Made to Stick: Why Some Ideas Survive and Others Die, authors Chip and Dan Heath share research that reveals we’re more likely to donate when we hear the story of an individual in need rather than data about an entire impoverished area. Even though a region’s suffering has a larger impact than that of an individual, the individual’s story is appealing because we have an emotional response when hearing the experiences of others, not statistics and abstract information. To apply this principle to your social media marketing, tell a story to reach your audience emotionally. Guinness does this well through their marketing campaigns. Rather than spout information or simply show a scene, this ad takes the viewer through a complicated situation that gradually unfolds to reveal the outcome. Ads like this one follow the “show, don‘t tell” principle. They lead audience members through a story they need to interpret for themselves based on the actions of the characters. Your social media content can impress your audience and be more memorable if you share a personal experience; whether it‘s your own or someone else‘s. By creating a journey with a resolution, you can make an emotional impact on your viewers. Expressing how people can benefit from your product or service will help you increase engagement on social media. Taco Bell’s Twitter account socially engages its audience with its witty and interactive tweets. Most importantly, the people behind the account understand what makes people tick. Take a look at this popular tweet. Who wouldn’t like a free meal? Taco Bell creates an image of fun and generosity, which inspires brand loyalty and makes the franchise relatable. Imagine what people are thinking as they watch the World Series. 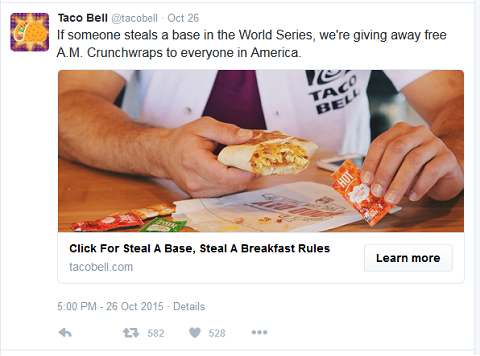 They’re likely hoping someone steals a base with the promise of free breakfast from Taco Bell. This keeps the brand at the top of its audience members’ minds. Of course, you don’t have to give everyone in the country a free breakfast to garner attention. There are other effective methods to let people know what you or your product can do for them. Taco Bell’s strategy shows that captivating the audience begins with thinking about what they want, first and foremost. The next time you share something about your brand on social media, explain or show why it will make a difference in people‘s lives. These days, reviews and testimonials on products and services are available at the click of a button. Consider a 2008 study that involved hanging public-service messages on residents’ doors, asking them to use fans instead of air conditioning. Results found that telling a group that 77% of their neighbors were using fans was more effective than mentioning residents could save $54 a month. What our peers do, impacts our decision-making. 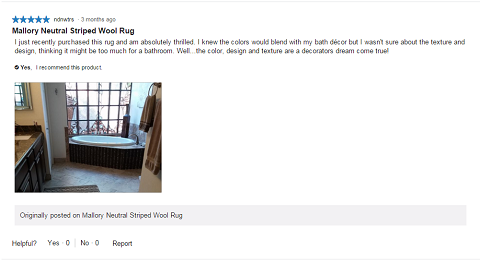 Crate and Barrel’s website invites customers to leave reviews for products and gives them the option of uploading a picture. Pictures help other potential customers visualize how the product would look in a home setting. Invite customers to leave reviews for your products and services. There are a number of ways to create social proof; show Facebook likes and post testimonials to tell your audience about how popular your product is. 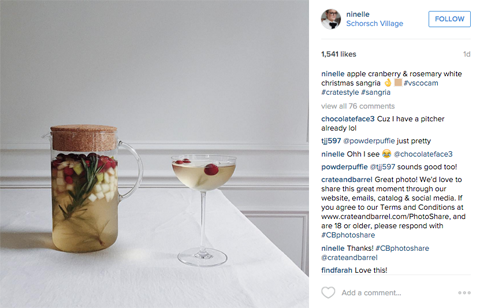 Crate and Barrel also encourages customers to load images of their products in use to Instagram with the hashtag #CrateStyle. Invite customers to post images of them using your products and services. The most effective social proof, though, is created when you have unmoderated positive reviews. Your followers will know that your product or service is remarkable enough that happy customers vouched for you on their own account. Partnering with an authority figure will improve the perception of your brand if it’s someone people trust, respect or like. If the person is recognized and successful in his or her own career, it reflects positively on your brand. Sadly enough, the reverse is also true. If an endorser gets bad publicity or is not doing well, your brand might suffer, too. These principles apply even if the person is not an expert or authority in the field that he or she is promoting. Professional tennis player Maria Sharapova is highly sought-after for endorsements because of her successful career and wide social media following. As an endorser of Tiffany & Co., among other brands, she uses her social media platforms to display products to her followers. 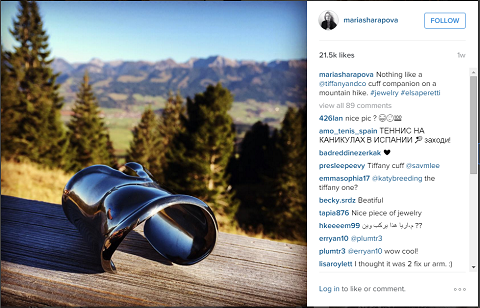 Here, Maria shares a picture of a bracelet by Tiffany on her Instagram account. Partner with someone people trust. When people are uncertain or don’t know how to act in a situation, they often look to others for guidance. In Influence: The Psychology of Persuasion, Robert Cialdini revealed that people are more likely to follow instructions when they’re given by an authority figure. Ask a respected person in your industry to publicly endorse your brand. It can work wonders for building credibility. Can’t find an authority figure? Build your own authority by using credibility markers such as sharing your previous experiences, educational background or recognition that you’ve received for your work. People want what they can’t have. Cialdini’s book Influence also discusses how people value something more if it’s rare. In 1985, Coca-Cola performed an experiment on whether people preferred the traditional Coke or their newer formula. In blind taste tests, 55% of participants preferred the new Coke. When the identities of the formulas were revealed, preferences for the new Coke went up by 6%. However, when the traditional formula was replaced, people preferred the old Coke. One of the most effective ways to grab people’s attention and make them take action is to make something scarce. 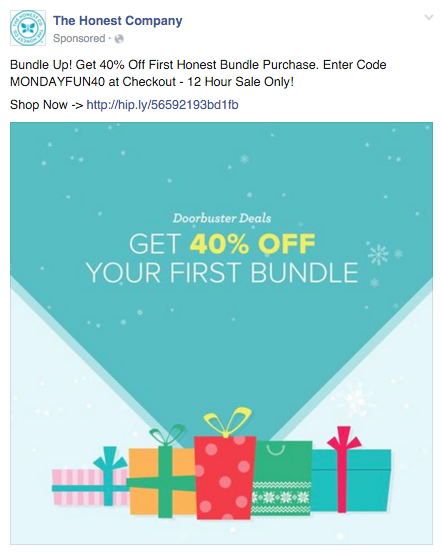 In this Facebook post, The Honest Company uses the principle of scarcity by showcasing a deal that is available only for 12 hours. Create a sense of scarcity or urgency to compel people to take action. People fear the chance of missing out on something, compelling them to act. You can create the feeling of scarcity by offering to give away or sell something in limited quantities or for a brief period of time. You can also create the impression of scarcity by selling your brand on its uniqueness, whether through your brand’s personality, emphasizing services that aren’t offered elsewhere or highlighting advantages in the way your brand operates. Social media is often the first point of contact with your target audience. Applying psychology to how you market to that audience gives you a head start on building an engaged community. What do you think? 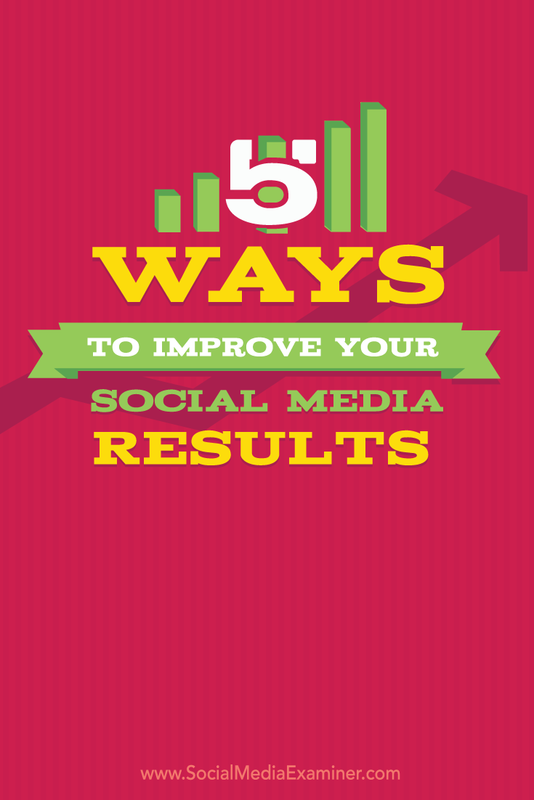 Have you tried using these tactics to improve your social media marketing? Which psychological techniques do you find to be the most effective for your brand’s content? Please share your thoughts and experiences in the comments below. 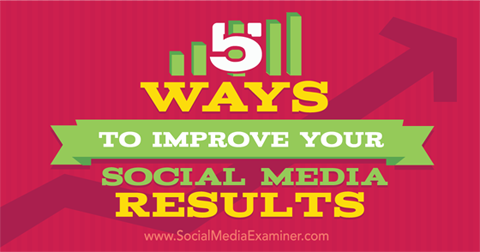 Five tips for improving your social media results with psychology. Melissa runs Jumpstart Your Dream Life, where she uses her powers of psychology to help entrepreneurs get productive, have more free time, and get the most out of their businesses.